Welcome to the British railway maps page. Each of the 22 maps, that is accessible here, is offered in two formats - .png and .pdf . A .png image can readily be incorporated into a document, with text and with other images. But if you just want to make a paper copy, perhaps before catching a train, then the .pdf will be found to give the sharper printout. Adobe Reader's Print dialogue will show a tick, in a box called 'auto-rotate and center'. It is suggested that this default be accepted. The first 10 of the 22 maps are geographic maps. 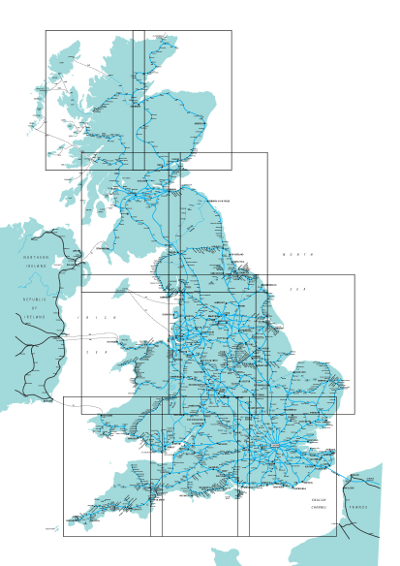 They collectively cover the whole of Great Britain, as shown in the following overview. If printing is onto sheets of A4 paper then they will overlap by about an inch. The remaining 12 of the 22 maps are schematic, and zoom in on the major conurbations. Map numbers 11, 12, 13 and 14 cover London and the South-East. Maps 15 and 16 are similarly contiguous, as are maps 17 and 18. Adobe Reader will present some of these schematic .pdf's sideways, but they will print out as expected.